is the term used by Sikhs to refer to any compositions of the Sikh Gurus. Gurbani is composed of two words: 'Gur' meaning 'the Guru's' and 'bani' meaning 'word'. 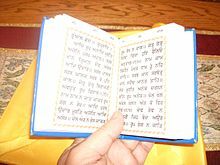 Extracts from Sri Guru Granth Sahib ji are called Gutkas (small books) containing sections of Gurbani. The Banis Japji Sahib, Jaap Sahib, Tav-Parsad Savaiye, should be read daily according to the Sikh Rehat Maryada. 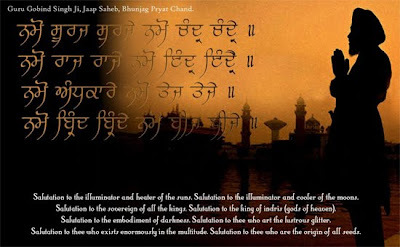 These are recited by initiated Sikhs in the early morning (before 6am). Rehras Sahib is read in the evening (at sunset) and Kirtan Sohila before going to sleep at night. wherever I look, there He is.